The 1940s gave us some iconic designs. Wide ties and zoot suits swept into men’s fashion. The Hillman Minx and Austin 16 tore onto the roads. Eames chairs began to fill up houses. 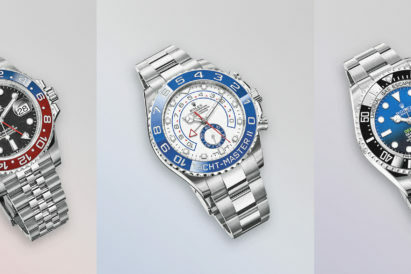 And Vacheron Constantin, the luxury Swiss watchmakers, were creating their seminal Reference 4240. Times weren’t easy for the watchmakers. The Great Depression had dragged them down the decade before, and they were using Jaeger-LeCoultre movements in their watches, including the 4240. 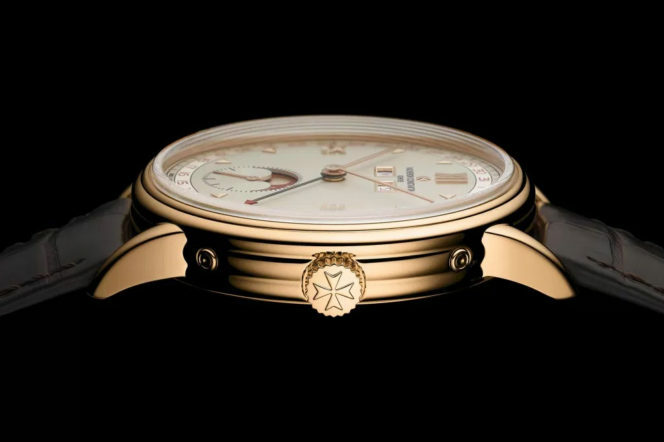 But, although it may not have been Vacheron through and through, its design became iconic enough to be reborn decades later in the Historiques range – the line used to resurrect and improve wristwatches from years gone by. The Triple Calendrier 1948, then, is the best of 1940s design with updated modern attributes, movement and size. The original was 35mm, but the updated version is 40mm wide, 10.35mm thick and boasts a water resistance of up to 30 metres. 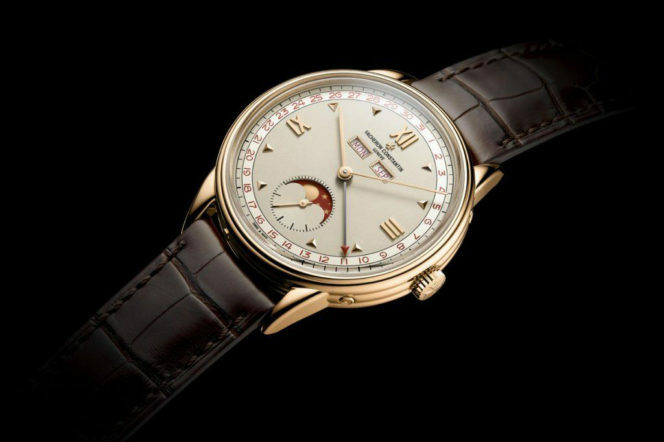 "The Triple Calendrier 1948 is the best of 1940s design with updated modern attributes, movement and size.."
The case is 18 carat pink gold with traditional lugs and sees the iconic moon phase indicator integrated into the 6 o’clock sub-dial. Through the back, the hand-wound 4400 QC movement is visible – upon which is engraved the hallowed Geneva Seal, an accolade proving jut how intricately and meticulously-engineered this with is. 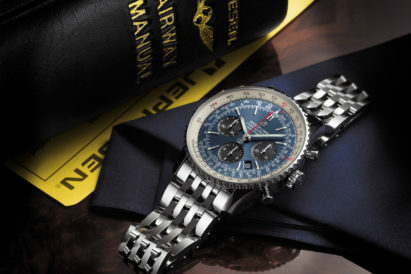 253 components make up the movement, and endow it with 65 hours of power reserve. 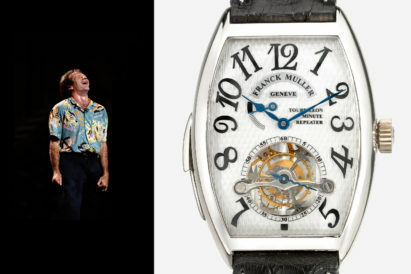 But the movement, although sound, is not the most striking thing about this watch. That would be the red accenting around the dial. 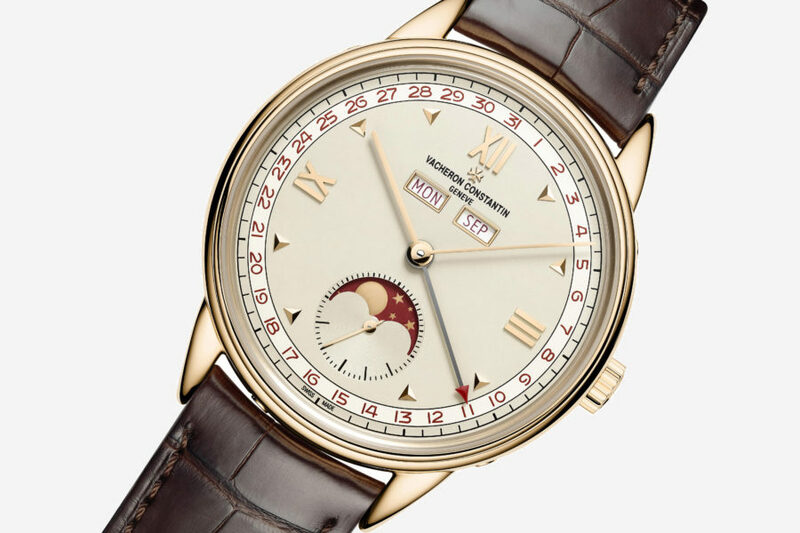 From the numbering to the minute hand’s arrow tip, hints of red fleck the face – the most unusual of which being the red background of the moon phase disc. It’s a bold move, and one that may have clashed with the rose gold, but instead, with sparing use, it has paid off handsomely. Finished with a dark brown leather strap fitted with an Ardillon buckle, this is the perfect homage to the watches of the 1940s, and updated in size and movement so it feels as current now as it did those seventy years ago.